In the play, "Friends in High Places" by playwrights Judith Sapperstein & Gary Murway, aliens land on the mall in Washington DC. They have a problem and need our help but meet first, our very corrupt president, President Arnot Thinkinear and his equally corrupt advisor. These aliens have some VERY odd customs and the antics that ensue between them and our government are quite hilarious. After the play ends is where this series picks up. 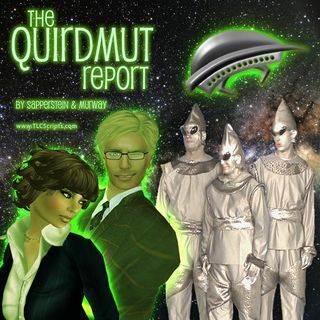 The aliens from the planet ... See More "Quirdmut" have invited a delegation from Earth to visit their home planet. And so our stalwart news anchors from YMI News hop a space ship with Senators Les Manly and Mona Lott, and take a little trip. We hope you enjoy the fun as we meet new characters, Buffy Lighthead, Isha Shamie and more.